WINNER! 'Best of Show- Gotta Stock It' at 2010 Summer NAMM Show. 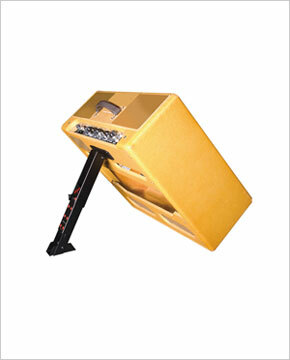 The most portable amplifier stand designed and ideal for the professional, it works well for an advancing musician! Mono-pod design provides adjustable angle and works on cabinets up to 36" high. Works on 18 to 32 inch open or closed back cabinets. Adjustable length for different angles and cabinet sizes. Four preset adjustments for angle and cabinet size. Keeps the cabinet in contact with the floor. Can be used with both open and closed back cabinets.